So far we've taught you a few things about Russia, from the place where Dostoevsky liked to stay in Saint Petersburg and locate the main characters of his novels (more in: The Tour of the Grand Hotel Europe), to the punishment Russians had to go through if they forgot limits when drinking nation's favorite distilled spirit (more in: visiting Russian Vodka Museum). In this week's video, you will get to know Russia's culture even better as our engaging rep Vera tells you how Russians celebrate Christmas and New Year as well as shares a secret recipe for the signature dish that can be found almost on every Russian family's table during the celebrations. 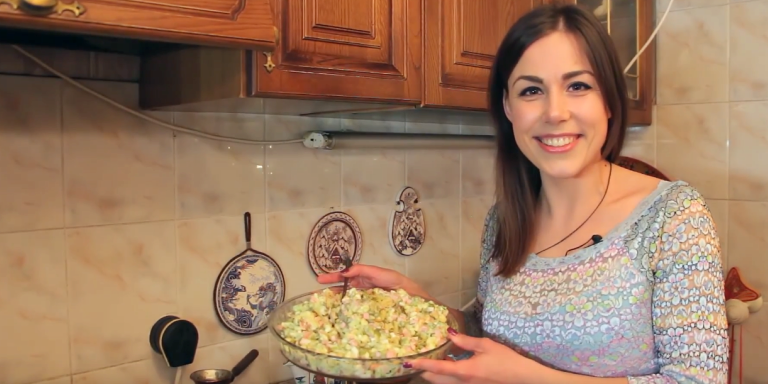 As seen from the video, locals can't imagine their celebration feast without the famous salad which is called "Salad Olivier". The dish was created by Belgian chef (who might have been French) who ran a Parisian-style restaurant "Hermitage" in Moscow in the 1860s. The salad instantly made the restaurant most-talked about and visited in Moscow, so chef kept the recipe as a trade secret and in fact, took it to the grave with him. The mysterious recipe survived with the help of two sources - one being an employee having a snoop around the kitchen when the chef was called away, and the latter - a customer who found the way to keep tasting the salad after the passing of its creator. You can taste the salad too and make it at home using Vera's recipe. You will need to boil potatoes and carrots in their skin, then while you wait for them to cool down, boil eggs and boil meat. Peel and dice potatoes, carrots, eggs, meat and dill pickles into small squares. Add green peas and salt. Trust your own taste with greenery. Lastly, stir in mayonnaise and mix the salad. We recommend leaving the salad in the refrigerator for a while before serving. Taste more than Russian salad with an exceptional private or small group tour travel arrangements to Saint Petersburg.